Today, we will explain in detail the applicable procedures for Generators Sizing Calculations for Existing and New Installations. Step#6: Check for transients or harmonics by using power analyzers and de-rate the peak load value. Step#14: Assign Required Number Of Steps/Starting Sequence. Now, we will explain in detail the above steps of Generators Sizing Calculations for Existing and New Installations. Application requires less than 100 hours of use per year, with a variable load factor of 70 percent or less. The typical peak demand would be 80 percent of standby rated kW with 100 percent of rating available for the duration of an emergency outages. Applications with these limits include building service standby where the units are in an enclosure or other sheltered environment. 2- Prime rated gen sets are divided into two areas of use. Peak demand is 80 percent of prime plus 10 percent rated kW with 100 percent of rating available for the duration of an emergency outage. They are best utilized in standby, rentals or power modules, or where there is unreliable utility power and/or interruptible rates. They are most common where the gen set will be the only power source. At the prime rating, a gen set can be used 24 hours per day, 365 days per year (no hour-use limit). 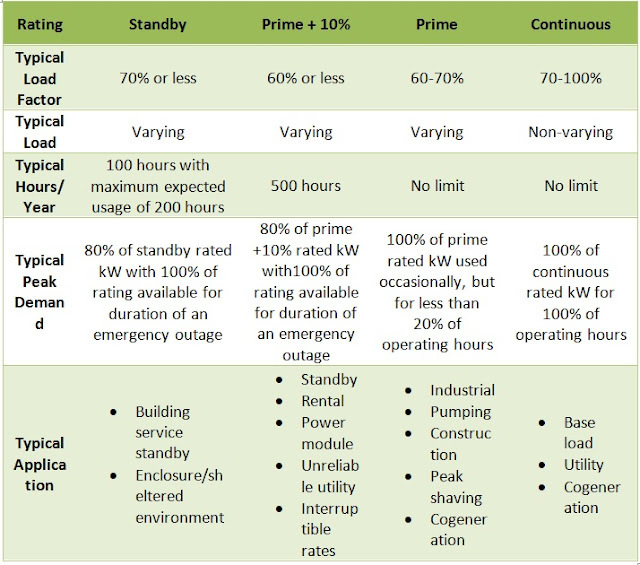 In most installations, they are specified to meet the demands of a variable load that is 60 to 70 percent of the gen set rating, but can supply 100 percent of its prime kW rating for less than 20 percent of operating hours. They are used in industrial pumping, construction, peak shaving and cogeneration applications. The application loads are non-varying and has no hour-use limit. Typical peak demand is 100 percent of continuous rated kW for 100 percent of the time. 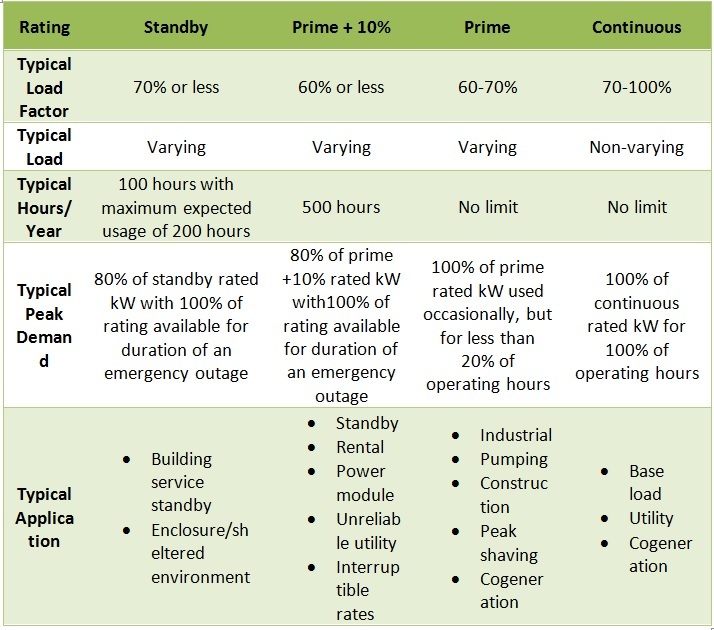 The following table summarizes the conditions for selecting the proper generator(s) set rating for your application. For smaller single-phase loads, these Generators usually do not go above 40 kW. They are commonly used in residential environments and have a power factor of 1.0. Mainly for larger industrial power generation, these Generators can provide both single and 3-phase power for running industrial motors with higher horsepower, branch power out for separate lines, and are in general more flexible. They are typically used in commercial environments and have a power factor of 0.8. The three-phase selection permits single-phase loads to be connected. To determine the size of the generator needed, we must assign the applicable voltage range. There are three voltage ranges; Low, medium, and high. Low voltage is the voltage on a local level or part of a site. Medium voltage is a low level distribution rating. This voltage is distributed to power residential sites and other campuses. High voltage runs over regions and is the voltage at a utility or the national grid. 600 V or less with 800 kVA for less than 250 V is typical. 601 V-5000 V with 5-10 MVA is the range for the medium rating. 5001 V-15,000 V used with MVA’s greater than 10 are considered High Voltage. 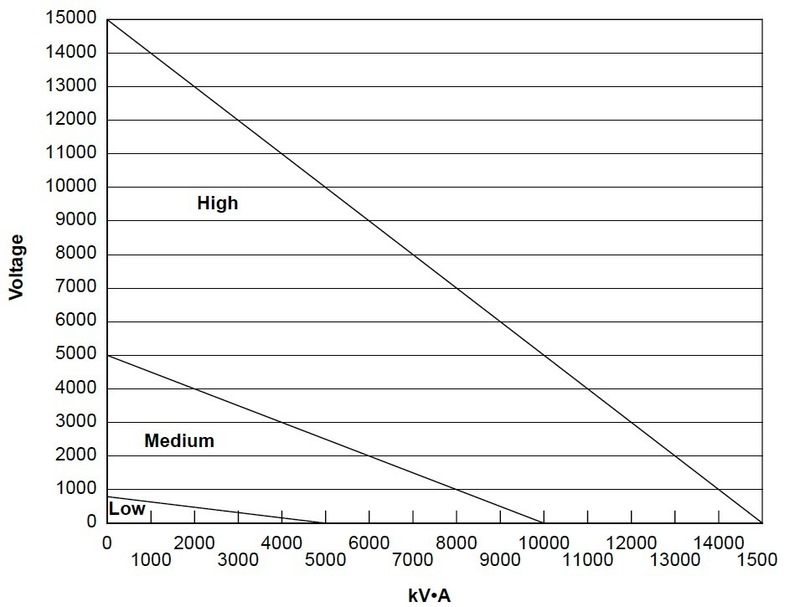 Figure.1 shows a voltage versus kVA chart, indicating low, medium and high voltage selections. This is the standard voltage for single phase systems. 120 V is common for office equipment and small single-phase motors. Motors are limited to 10HP maximum. Either 120 volts or 240 volts can be used to supply loads. 120 volt loads must be balanced across the generator L1 to N and L2 to N. Disadvantages are that single phase motors are more unreliable than three phase motors, especially capacitor start motors. The voltage drop is higher in single phase systems for a given load for the same wire size used in 3 phase systems. This is a good choice for a three phase system because you can balance 120 volt loads around the wye to equally load the generator. 208V single phase and 208V three phase loads can be used as well as 120V single phase loads. Motors must be rated 200 volt operation; 240 volt resistance heating equipment used on a 208V generator will only produce 75% of its rated KW output. This voltage is usually used on large systems to reduce incoming service size, wire size and distribution equipment size. Fluorescent and other discharge lighting can be used at 277 volts. 480 volt single phase, 480V three phase for large air compressors, motors, chillers, and air handlers, and 277 volt single phase loads can be used on this system. Also good for minimizing voltage drops on long runs. Disadvantages are that a step down transformer is required to get 120/208 or 120/240 volt power for lights and outlets. Motors should be started directly from the generator buss, not from a step down transformer to minimize voltage drop. This Voltage should not use on generator as it overloads 1 phase if there are large 120 volt loads. This is the least desirable voltage to use if there is a large amount of 120 volt load. The generator cannot be balanced and may overheat the windings. Advantages are 240 volt motors and equipment are more common than 200 volts. Why analysis and categorization of generator loads is very important? Loads have different electrical characteristics. When developing a load analysis, it is helpful to analyze and categorize generator set loads into groups with common characteristics to assure proper consideration of their power demand because A generator set is a limited power source, sometimes referred to as a “limited bus”. The limited bus does not have the reserve capability of a utility grid. There are no rigid standards for categorizing loads. Enter running kW for all motor loads (except the largest) expected to run during peak load levels into Table-3. Refer to Table-1 for typical motor load sizes and electrical requirements. Starting kW for loads with no listed HP; calculate HP based on running amps in Table-4 below. PF is the load power factor - Typical application power factor is 0.95. Enter kW for all non-motor loads expected to run during peak load levels into Table-5. Refer to Table-2 for typical residential loads and rules of thumb. This step is used to evaluate whether the standby power system should be composed of a single large generator set or several smaller generator sets operating in parallel. Essential Or Critical Loads: such as life-safety systems; security, computer and data systems; communications; or certain critical manufacturing processes. Important, But Not Critical Loads: such as ventilation systems, general lighting and less-vital manufacturing processes. Non-Essential Loads For Business Continuity: an example might be the HVAC system, unless it is needed for cooling major computer or data facilities. Install a system with multiple smaller, paralleled generator sets. The impact of load growth and reduction of future expansion costs. However, the lowest cost should never be the sole consideration when implementing a standby power system. Care must be taken to review the total project requirements, capabilities, and cost tradeoffs as explained above. In the next article, we will continue explaining the applicable procedures for Generators Sizing Calculations for Existing Installations. So, please keep following.